You are here: Home / Metal / What is Welding? The large bulk of materials that are welded are metals, although the term “welding” is sometimes applied to the joining of other materials such as thermoplastics. In order to join two or more pieces of metal together by one of the welding processes, the most essential requirement is heat. Pressure may also be employed, but this is not, in many processes, essential. The application of welding in today’s technology is extensive. The use of welding in joining metals has had a phenomenal rise since the 1930s; this growth has been faster than the general industrial growth. 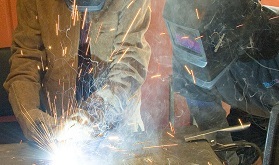 Many common everyday items are dependent upon welding for their economical construction. Our modern automobiles are of welded construction; many thousand welds are used in the fabrication of each automobile. Many items in the nuclear and missile field could not be fabricated except by the use of welding for assembly. Electronic equipment in wide use today requires special welding techniques for assembly. Household appliances, kitchen utensils, bridges, ships, aircraft, buildings, farm machinery- all are made more economically in today’s technology by using one or more methods for joining by welding. Modern devices and appliances are complicated, and engineering knowledge is essential in the application of today’s tools for welding. Welding is no longer an art in which a craftsman is in complete control. Engineers with training in the fields of electricity, mechanics, materials, and structures ensure the usefulness of welding as a modern means of joining metals into structures with strength and stability. Welding depends upon the application of principles taken from many branches of science. For example, the physicists measure the thermal behavior and electrical characteristics which control the preparation of welded joints. The chemist is helpful in compounding fluxes and special alloys for many applications. The metallurgist provides much of the fundamental information which is required in modern welding. By application of engineering principles, the techniques which are necessary in order to produce sound, serviceable welded joints can be developed. The contributions of many branches of physical science have been important. Although the ease of joining by welding varies among the modern metals, techniques have been developed for producing satisfactory joints in almost all of the metals and alloys.